LONDON, UK, November 2, 2016 (ENS) – Bumblebees can learn to pull strings for food and pass on the skill to a colony, according to researchers at Queen Mary University of London. Pulling strings to obtain food is an experiment often used to test the intelligence of apes and birds, but this is the first time this technique has been discovered to work in an insect. The cultural spread of such a technique from a single informed individual also has been described for the first time in an invertebrate animal. 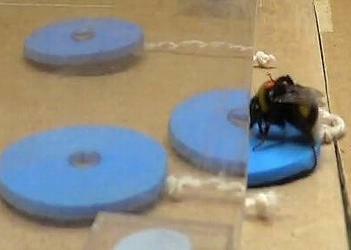 The results, published in the journal “PLOS Biology,” show that rare innovator bees were able to solve the problem of pulling the string to reach a sugar water reward by themselves while most others could learn to pull the string when trained. 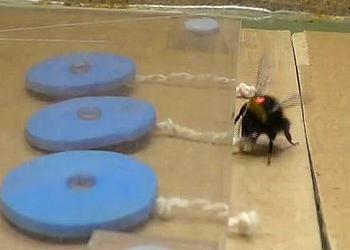 Naïve bees were then able to learn the task by observing a trained demonstrator bee. The string-pulling skill was passed down through several generations of bee learners, ensuring its longevity in the population. To test the bees’ capacity for learning string pulling, they were presented with three artificial blue flowers with a string attached to each flower and placed under a small transparent Plexiglas table. Initially, 23 bees, of a group of 40, were able to be trained in a stepwise manner by placing the flowers and strings at progressively distant positions under the table. Another group of bees was given the opportunity to solve the task spontaneously, without any training, and only two of 110 were successful. Naïve bees were then allowed to observe trained bees pulling the string from a distance and 60 percent of them successfully learned the skill. Finally, trained bees were placed in colonies and researchers observed that the technique spread successfully to a majority of the colony’s worker bees. In a video made by the researchers, an experienced bumblebee worker is seen pulling a string to extract an artificial blue flower disk from underneath a transparent table and then drinking the sugar solution found in the center of the flower. The bee lands in front of a string, grasps it with her forelegs, and pulls the string with both legs alternately. She uses her mandibles and extracts the flower from under the table by moving her head upward and backward. Finally, the bee steps onto the blue flower and moves her forelegs and middle legs back and forth while pushing with her head against the edge of the table to slide the flower out from underneath the table to access the sugar-water reward. He said the research team is still a long way from understanding the required neural circuitry for string-pulling. Titled, “Associative Mechanisms Allow for Social Learning and Cultural Transmission of String Pulling in an Insect,” the study is online here.